Far Cry’s map editor has always been fantastic, but it’s never been utilised in a way that allowed it to be shown off. It was an extra on a huge game, where impressive community creations remained in the community and didn’t make waves elsewhere. Far Cry 5’s map editor could change all this. Related: Co-op breathes life into Far Cry 5. With Far Cry 5’s map editor, you don’t just make maps. You can make your own solo, co-op, and PvP levels. You can make them using the assets from the game, but assets from Assassin’s Creed and Watch Dogs will also be available to steal. Essentially, you can stitch together your very own Ubisoft game. In total, there are over 9’000 elements from Far Cry 5, Far Cry 4, Far Cry Primal, Assassin’s Creed Unity, Assassin’s Creed: Black Flag, and Watch Dogs to choose from. More objects will be added in six separate updates after release. 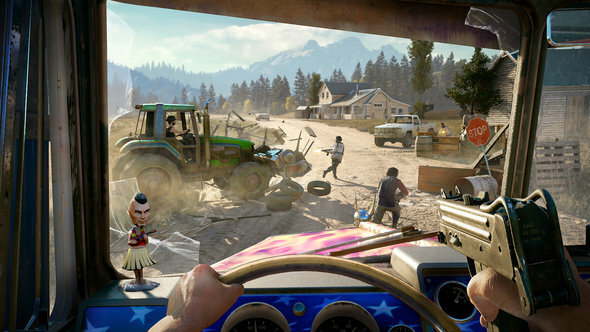 Dubbed Far Cry Arcade, the mode will be filled with missions created by the community, as well as some created by Ubisoft. Playing games in Far Cry Arcade earns you money and perks for the main game, so there’s a reason to dip in.